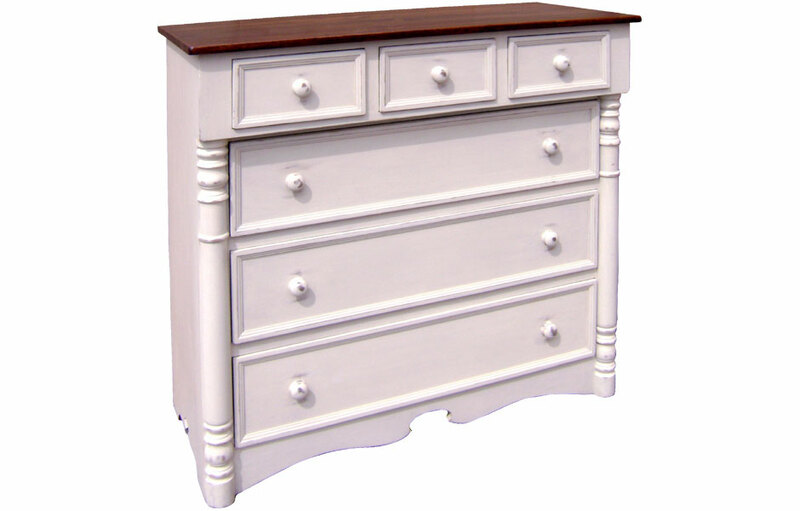 The Bonnet Chest of Drawers is our version of a dresser originally designed in the 19th century to hold Sunday bonnets. Our take imparts the classic details but adds modern function. The bureau has six drawers total, (3) upper small and (3) lower full width. The face features a turned leg column adding dimension to the dresser. The three upper drawers overhang the lower three drawers. The Bonnet Chest of Drawers is a decorative dresser originally designed in the 19th century to hold Sunday bonnets in the top drawers. Our charming adaptation of Bonnet Chest imparts the classic details of the classic piece while adding modern function. 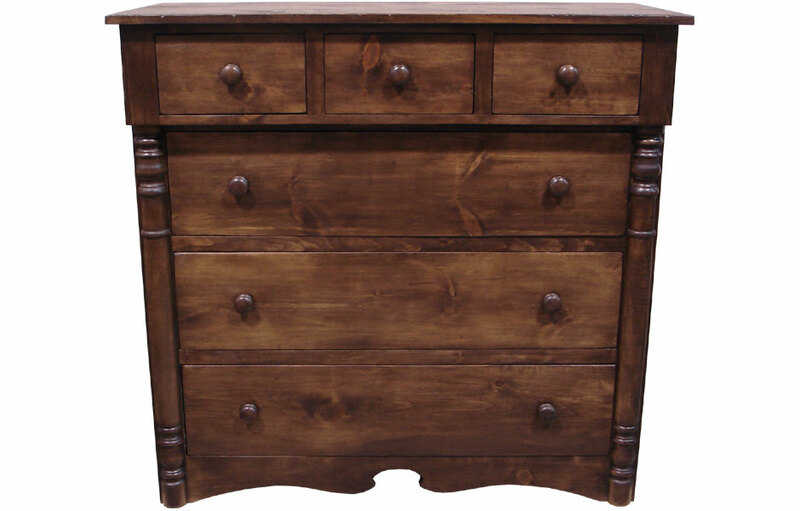 Our dresser features three large, deep upper drawer for small items, undergarments, and socks. The upper drawers slightly overhang the lower drawers. 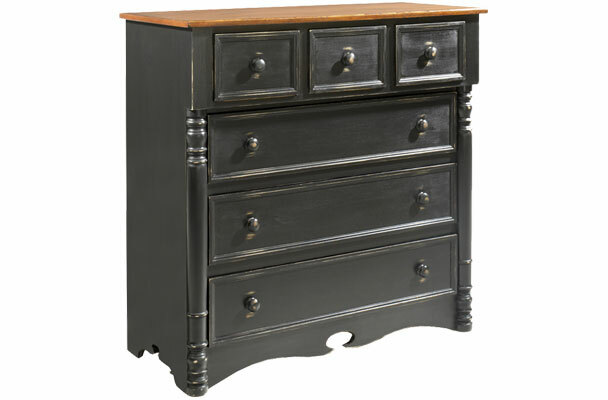 The face features a lovely turned leg column adding dimension to the dresser. The three full-width lower drawers provide lots of storage for folded clothing. The scrolled keyhole decorative base completes the design making it one of our most beloved bureaus. The 6-drawer dresser offers ample storage for folded shirts, pants and bulky sweaters. The drawers slide effortlessly on traditional wood glides for ease of use. The drawers, including the bottoms, are made of solid wood adding to its strength and durability. The thick wood top is water-sealed to prevent water rings—and intended for daily use. 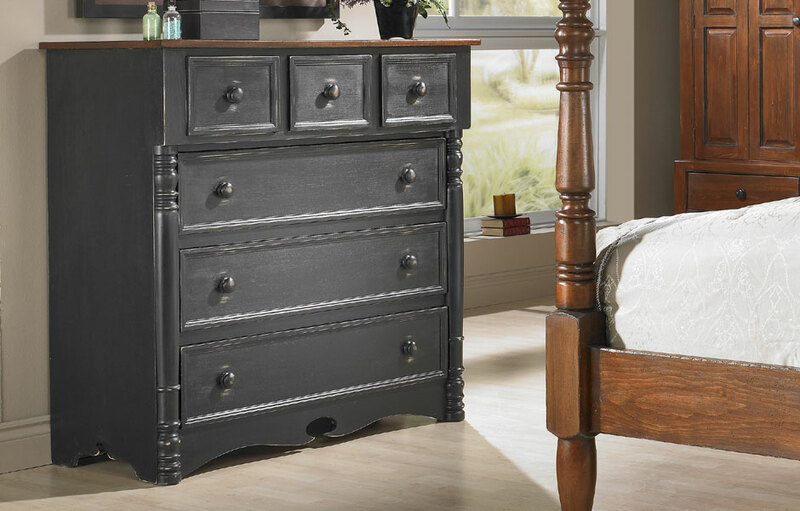 The six drawer dresser can be painted in a classic two-tone finish with a stained interior and top with painted exterior, or all-over one color finish. The Bonnet Chest, 6-Drawer Dresser complements French Country, English Cottage, Farmhouse, Rustic, Transitional and Traditional style decors. 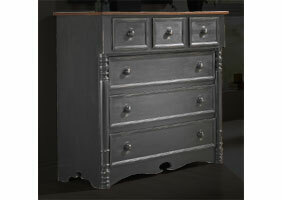 Bonnet Chest of Drawers finished in Black.